When the Hearts, Hands, and Smiles Dental Mission came to Villa el Carmen and Gran Pacifica Resort in January 2018, many new friendships were born. The members of the Hearts, Hands, and Smiles group, led by Rob Ayers of Pennsylvania, were very welcoming and invited residents and volunteers to join them in their medical efforts. 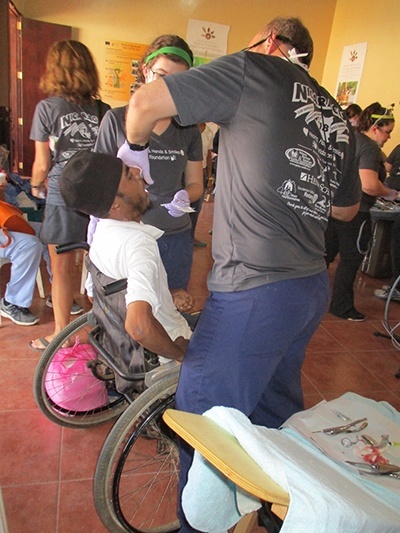 At the Alcaldia Health Fair, the members of the group provided dental care for 118 people in one day. 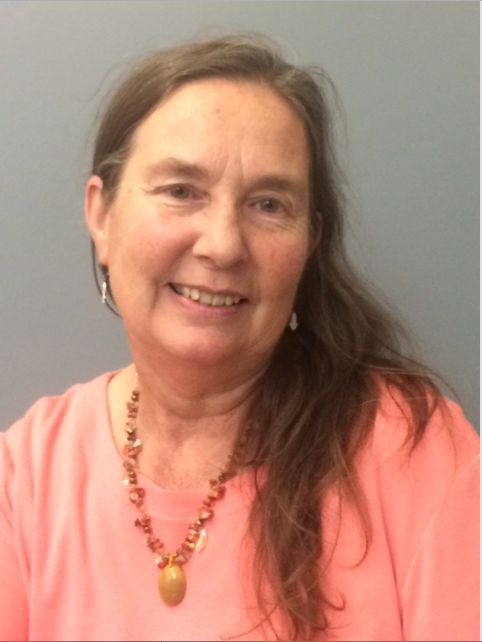 While there, I met a young man in a wheelchair who was waiting for dental work. While we were talking, it became time for the man to see the dentist who treated him for an impacted tooth. After his procedure, several members of the team accompanied him home to ensure that he got there safely – it was a hot day and they did not want him to overheat after his procedure. While at his home, they visited with his grandmother and another young 12-year old boy, as well as the young man from the Health Fair. We learned that at age 15, the young man had been badly injured by a bull, leaving him wheelchair bound. The young man was in need of a new wheelchair. While there, I asked Ruth Vado to put the young man on the list for a new wheelchair from “Chair the Love” – a joint effort between Gran Pacifica and the Wheelchair Foundation to provide wheelchairs to Nicaraguans in need. His grandmother told us that she had lived in this house for over 43 years and enjoys where she lives because it is quiet, her neighbors don’t bother her, and the 12-year old boy can attend school. After the visit, members of the dental mission and residents of Gran Pacifica decided to collect clothing and other household items to deliver to this family. The group returned later in the week to deliver over $300 worth of food, clothing, household items, and pharmaceutical items for the young man in the wheelchair. Additionally, they helped to provide food for the family’s dog and its puppies. The family was very happy to receive the items and thanked everyone in the group for the generous donation of supplies. A few days later, I received an email from the family asking if I could help to find a bicycle for the 12-year old boy as well as a Bible in Spanish that the family could share. 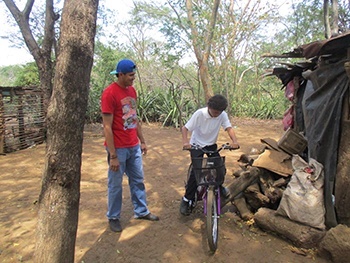 I went to Managua with my friend Rafael and purchased a bike and a Bible which I delivered to them the next week. While I was delivering these items, I was happy to see that a new wheelchair for the young man had been delivered as well. Again, the family was very thankful for the gifts and allowed me to take a few pictures. This is another example of how small acts of kindness and generosity can help to impact families here in Nicaragua.